Set up as a music venue/restaurant in the evenings, Egan's is dedicated to providing a positive community-centered environment for jazz education and performance. Club owner Suzanne Weghorst, a virtual reality researcher at the University of Washington, was motivated to open Egan's by the lack of appropriate places for young jazz musicians to play and to learn from more experienced artists. "It was through seeing my son learn from his tenor sax teacher Gary Hammon that I realized there was a need to preserve and honor not just the music, but the tradition of passing down the history and culture of jazz from generation to generation," Suzanne says. Egan's takes its name from Weghorst's maternal grandfather, a composer and performer who toured Europe before settling down as a theatre and club performer in New York City in the 1920s and 1930s. 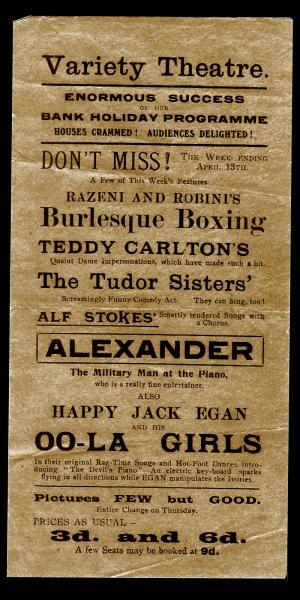 After incorporating as the Ballard Jam House, Weghorst came across an old London variety theatre playbill and discovered that, in addition to composing light opera, he had performed as Happy Jack Egan and his Oo-La Girls back around WWI and had composed some early ragtime jazz tunes. "Since what we were trying to do was in a similar vein to the old live variety theatre circuit, it seemed fitting to name the club after him."